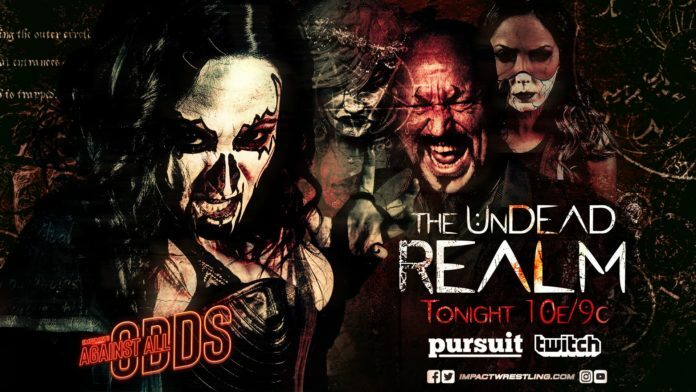 Impact Wrestling presented "Against All Odds" last night on Twitch and Pursuit. Impact Wrestling presented a special branded show “Against All Odds” last night on Pursuit and Twitch. Rosemary traveled to the undead realm last night in an attempt to regain Allie’s soul. It was then revealed that Kevin Sullivan (or a being in Kevin Sullivan form) was the leader of the realm. During Sullivan’s speech to Rosemary, Su Yung struck and stabbed Allie in the neck. As Allie lay dying, she became “whole again” and reverted back to the Allie of old. Gail Kim did resign from her position in Impact Wrestling as Tessa Blanchard wanted her too. What Blanchard likely did not want, however, is for Gail to announce she was coming out of retirement in order to come after her. With Rebellion coming up next month from Gail Kim’s hometown, could we see the Hall of Famer face arguably the hottest women’s wrestler in the industry today? A match between the two was made official for the PPV later in the evening. Taya Valkyrie used her champion’s advantage at Against All Odds against Jordynne Grace. The champion missed a moonsault and Grace looked to capitalize but the champion chose to duck tail and run instead, with help from Impact World champion, Johnny Impact. Grace might feel as though she is owed another shot at the Knockouts championship. There was some controversy at the end, but Killer Kross pinned Brian Cage this week. It looked as though Brian Cage kicked out after a Saito suplex at 2.5 but the ref called for the bell. After the match, Johnny Impact continued to deliver the beatdown to his challenger at Rebellion. Taya brought out a chair which Johnny used to target Cage’s arm. It seems Impact and Taya will do anything to save each other’s titles. Johnny wants to make sure that Cage goes into Rebllion injured. Scarlett Boardeaux defeated Glenn Gilbertti this week on Impact in inter-gender action. The Smoke Show is now showing she can get things done in the ring as well but will her success against the former Disco Inferno carry over when she enters the Knockouts division? Konnan warned each team against entering into this rivalry. Now, one team, the Lucha Bros, have turned their back on Konnan completely. This week, it was having Konnan in their corner which gave LAX the advantage. Konnan’s taunting of his former allies, allowed LAX to recover and put both Pentagon and Fenix through tables. This feud has been contested 2-on-2 up until now. With Konnan now in the corner of LAX and pulling for their victory over Pentagon and Fenix, that could be all Santana and Ortiz need to regain their titles. A match between the two teams was made later in the evening, under Full Metal Mayhem rules to take place at Rebellion. Last week, Madman Fulton was introduced as the newest member of OVE. Fulton attacked Rich Swann following Swann’s successful X-Division title match against Callihan. This week, we saw backstage segments of OVE along with their newest and largest member. With this new member of OVE in his midst, Callihan might be at his most dangerous.